Happy 4th of July! 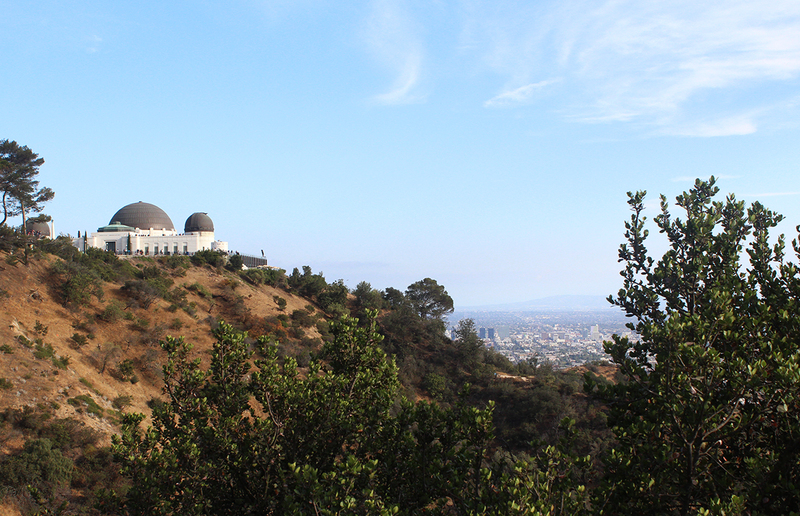 I thought it would be fitting to share some photos from last month's trip to California. My boyfriend and I drove from Los Angeles to San Luis Obispo to San Francisco along the coast and I'd definitely recommend everyone drive along Route 1 at least once in their life. I'll keep this post short and let the pictures do most of the talking. It was our first time in LA and we both enjoyed the city a lot more than we expected to. 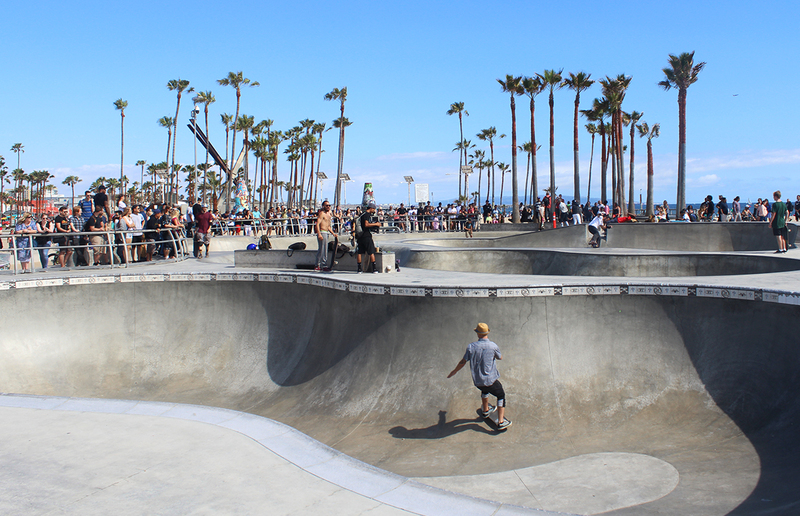 We stayed at an Airbnb in Hermosa Beach which was fantastic for getting some R&R (note the above photo was taken at Venice Beach). I wish the weather had been warmer so we could have spent more time at the beach. Apparently there's something called "June Gloom" in Southern California which brings cloudy skies and temps in the 70s. Luckily the skies usually cleared up in the afternoon so we still got a chance to soak in some Cali rays. I'm pretty envious of the fact that Los Angeles residents are so close to nature with their accessible beaches and various hikes. In New York we have to drive at least an hour to get to anything similar. That being said, you really have to drive in this city if you want to get anywhere within a reasonable time (just make sure to avoid traffic on the freeways). 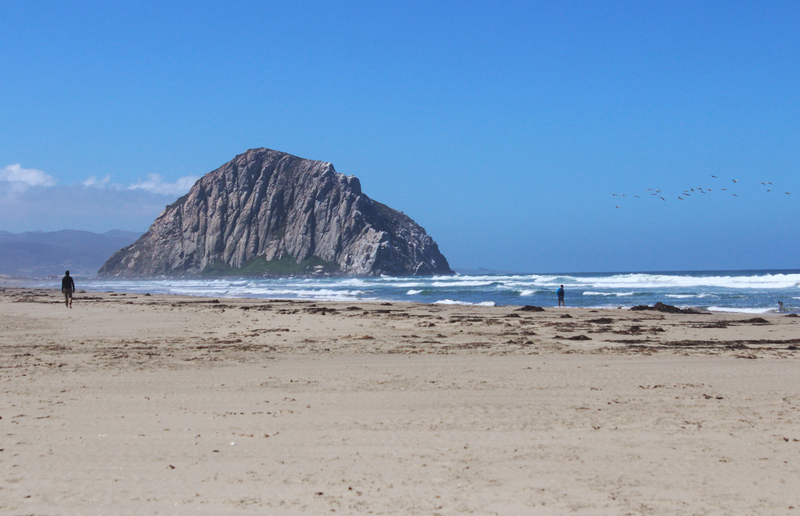 After a few quick days in LA, we drove up Route 1 where we would spend the night in San Luis Obispo. Regularly abbreviated as SLO, the town has been called America's happiest city and is a perfect pit stop if you're driving between LA and SF. 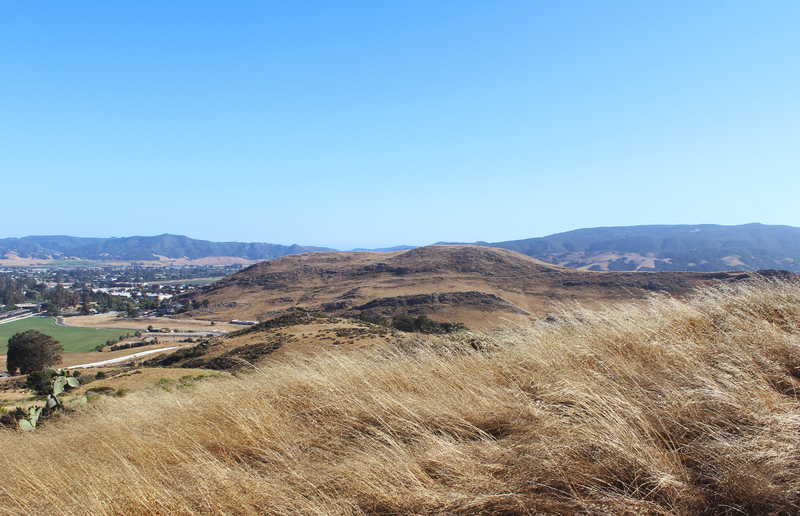 If you're a fan of hiking, there are a lot of beautiful trails to check out in SLO. We only had one night to spend here so we did the easy Lemon Grove Trail before tucking into another adorable Airbnb and chowing down on some California Pizza Kitchen take out. Sometimes I wonder how well I could adapt to a small city, rural life. Visiting cities that are nestled in nature really make me question the benefits of big city living. If we had more time, we would have definitely stayed another night or two here. 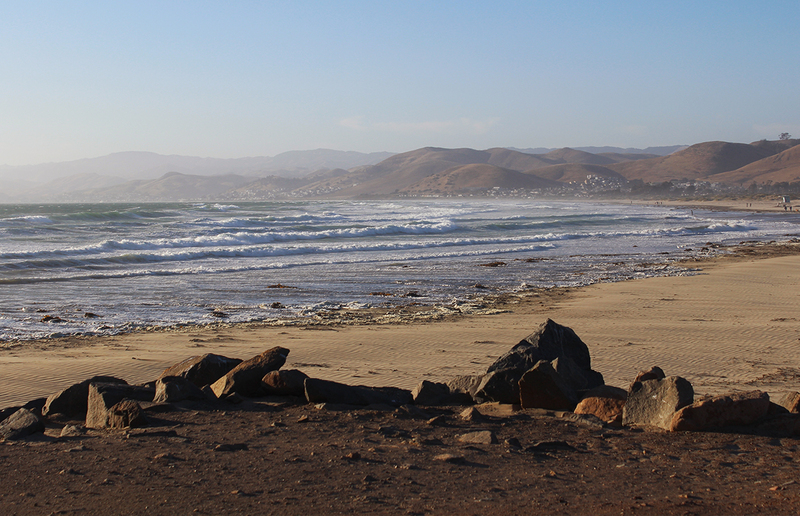 On our one evening in SLO we also went to Morro Strand State Beach to check out the view. The slight haze made the beach look surreal. This was one of the most picturesque spots as the sun was beginning to descend and the lighting was incredible. The next morning we were making our way north again and we stopped by Morro Strand State Park to get a better view of Morro Rock. The night before we had gone right up to the rock but it's really much more impressive from afar. Also, there are a bunch of cute critters like bunnies and small lizards in the beach vegetation leading into Morro Strand State Park which was a nice surprise! 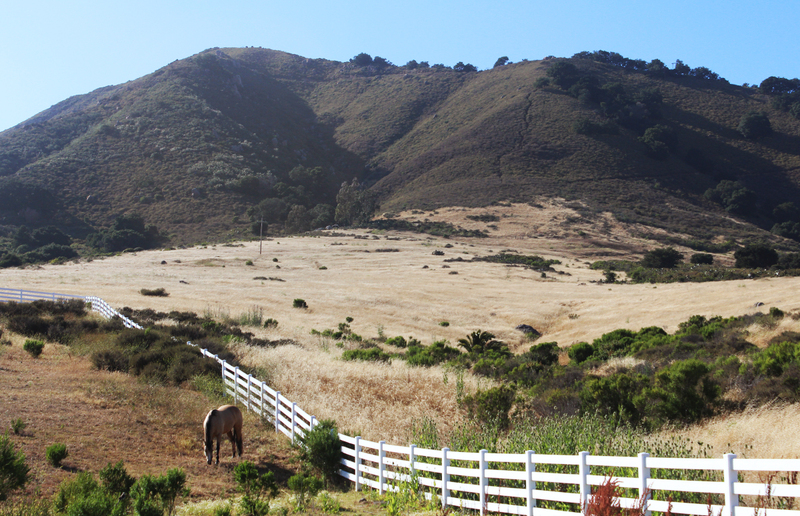 The beauty of Big Sur is unreal. You just can't take a bad photo here because every inch is stunning in its own way. The water is various shades of brilliant blue and the bright wildflowers pop against the olive and brown vegetation. 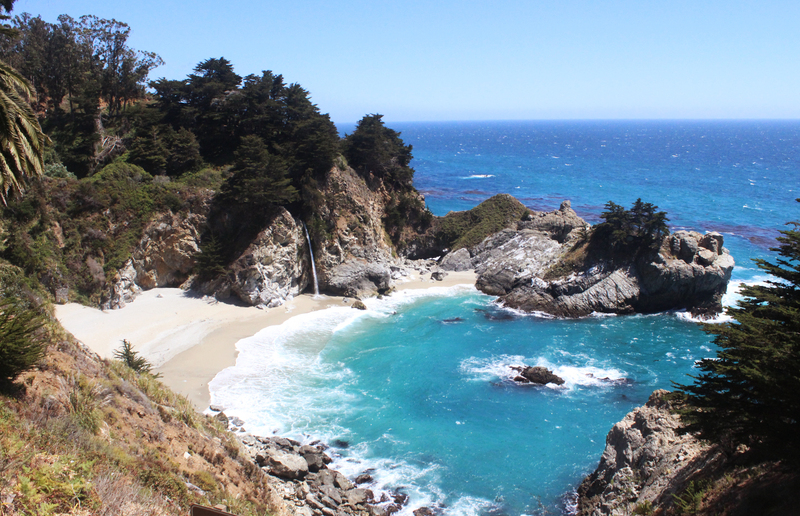 McWay Falls is a must-visit if you're driving along the coast. 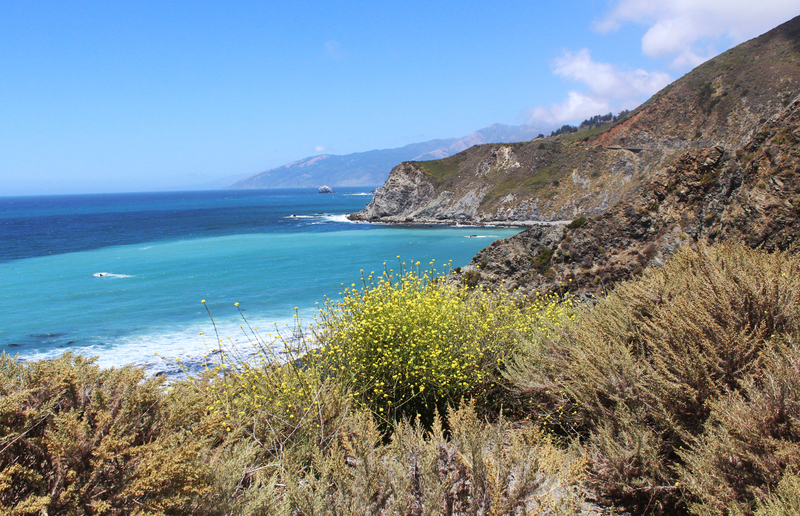 It's accessible through a quick walk through Julia Pfeiffer Burns State Park. 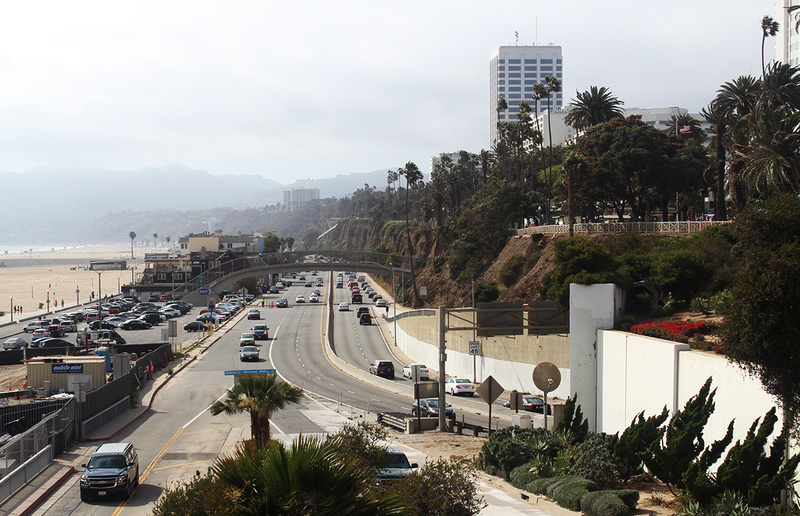 There's technically no beach access so you'll have to enjoy the view from above. But we saw some letters etched into the sand so there are definitely some thrill seekers who have gone off the beaten path to claim this bit of paradise. 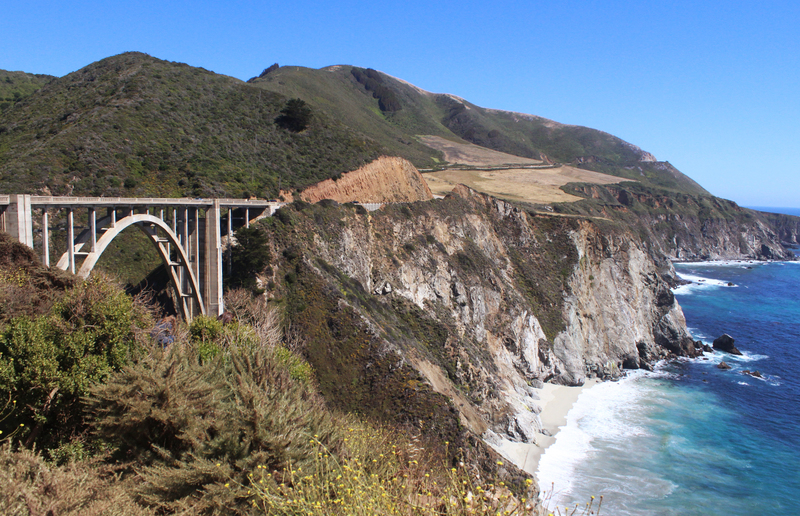 For the last stretch along Route 1 going through Monterey, you'll encounter the famous Bixby Bridge. In places like these I'm not sure what I'm more in awe of, the natural beauty that was here long before we were or the feats of engineering and design that have allowed us to transform the land. Finally after many hours of sightseeing and a couple of miles of traffic, we reached San Francisco. 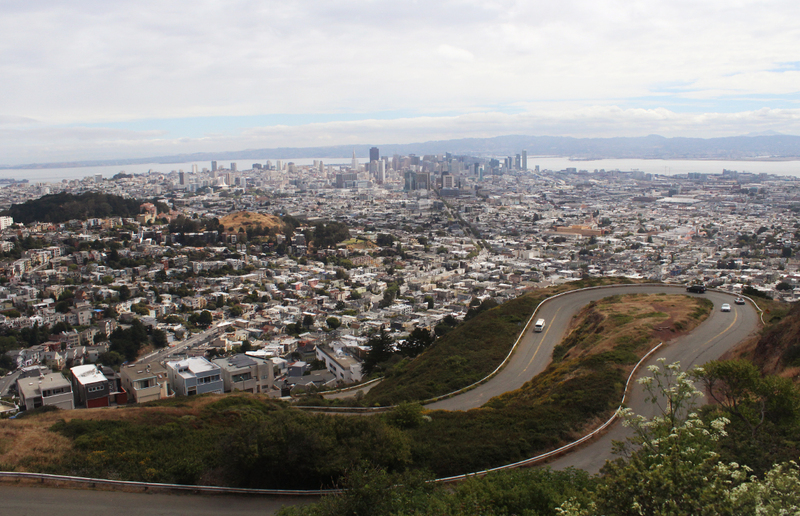 We've both been here before but still did a couple of the touristy things like visiting Twin Peaks and Lombard Street. I was able to reconnect with one of my managers during my intern days who's now based in the Bay Area and my boyfriend visited some of his coworkers who are based in their SF WeWork. All in all, a nice way to ease ourselves back into city life. 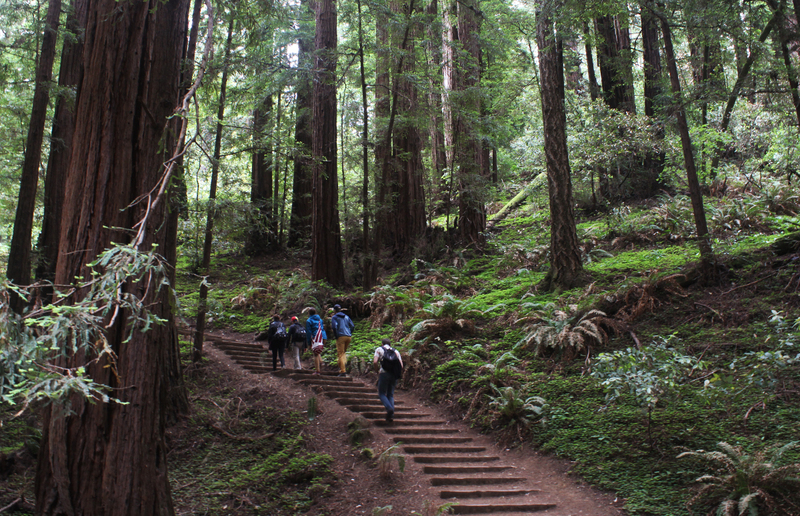 Oh, one last thing we made sure to do was to visit Muir Woods to see the famed redwoods of Northern California. The online reviews weren't lying when they said the parking fills up fast here. But once you get onto the trails, you'll have large swaths of the forest to yourselves with barely anyone else in sight. It's a really special place that I'm so lucky to have seen for myself. A week spent in California flies by because there is simply so much to do. I'm already thinking about what I want to do the next time I head out to this part of the amazing country I get to call home (probably less beach and more desert next time around). 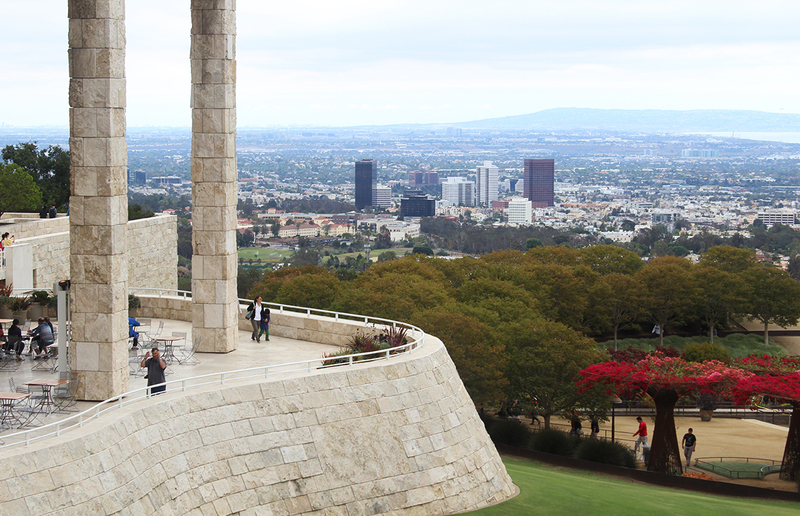 What are your favorite spots in California? Any recommendations on what I should look into next time I'm headed out west?